Used humanely crates can be an efficient, effective tool for housebreaking your puppy. When it comes to using a cage or transportation container it is very important to keep in mind that the purpose is to aid in housebreaking dogs. It is never to be used as punishment. Leaving a puppy in a dog crate for extended periods because you don't have the time to play with it or even ensure that they are able to relieve themselves before experiencing discomfort is not training. It is cruelty. Make sure the dog crate you use is big enough for the puppy or dog to be able to at least turn around in and not feel cramped in. They should feel safe and secure, not suffocated. Place it in a location that your dog feels comfortable in. You might have to think like a dog or take note of where your dog goes to relax. Maybe under a table or some other spot they are out of the way but can still see if someone is coming. Creating a positive association during crate training is essential. Offering special treats that they only get when they are in the dog crate may help. In order to have the puppy or dog accept it you may even feed them in the crate. 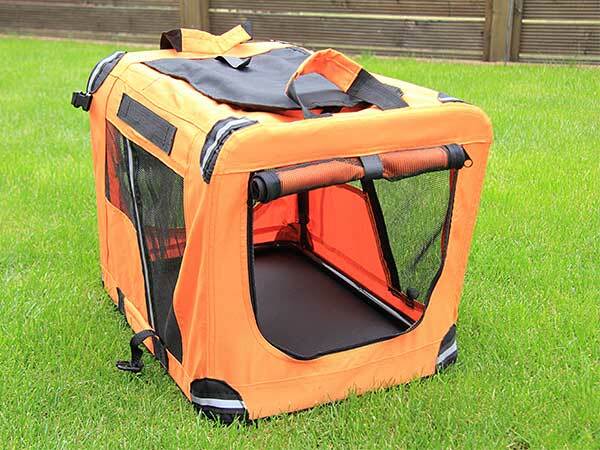 Soft foldable dog crates are another option instead of metal crates. The MidWest Life Stages crate also has a cover and a dog bed that fits in the crate (available separately). However, I would move their food and water out of the crate as soon as possible. You can still keep their bowls near the dog crate to maintain this positive association but only move them inside if necessary at the beginning of crate training. You are using the dog's natural den instinct to avoid soiling the area where it sleeps and eats. However, no matter how strong this instinct the most determined dog can only hold out for so long. It is your responsibility to ensure they are given the opportunity to relieve themselves. You should be aware of what is happening with any puppy or dog while crate training. When did it last eat and drink? How long before it will need to relieve itself? Don't leave them for more than 45 minutes without letting them out to do their business, get some exercise and play. Establish a positive routine with your training. Being placed in the dog crate should not be perceived by the puppy as a punishment and should not be used as such. They should not dread going into the crate. They should come to regard it as their den, a place of security and comfort. Make sure they have a comfy blanket, treats and maybe a favorite toy to make the place welcoming. First thing in the morning when your puppy wakes up, take it outside to the designated potty area. Use whatever command you would like to associate with doing their business and repeat it until they are successful. Choose a phrase you wouldn't mind the neighbors overhearing! Praise them enthusiastically once they go. Take them back inside for something to eat and drink. Shortly after breakfast take them back outside to the potty spot. Praise, praise, praise for success and back in the house for perhaps a nap in the dog crate. Repeat this process for lunch and dinner being sure to be aware if they need to be let out between those times to do their business or need to play for a while. If you stay on top of the situation it shouldn't be long before your puppy "gets it." Successful crate training requires consistency. Show Your Puppy The Way... To Their "Spot"
When removing the puppy from the dog crate, when it is time for it to relieve itself, take them to the place outside where you want them to go. Be sure to be consistent each time. Show your puppy the route to get to that place and it will come to associate walking this path with an appropriate bathroom location. Praising them lavishly for a successful mission will seal the deal. They will know that as soon as they leave the dog crate they go to a certain spot outside, do their thing and get rewarded. The key to housetraining dogs is to use the dog crate as a tool to help housebreak your puppy by teaching them the right place to go not as a dungeon to lock them up in so you don't have to take the time to train them properly. I can't stress this point enough. Proper crate training takes work and attention to what is happening with your puppy or dog, but in the long run is worth the extra effort. Aussies are especially smart and eager to please. You will be surprised at how quickly your dog will respond to this positive approach to crate training combined with praise, praise, praise and more praise!